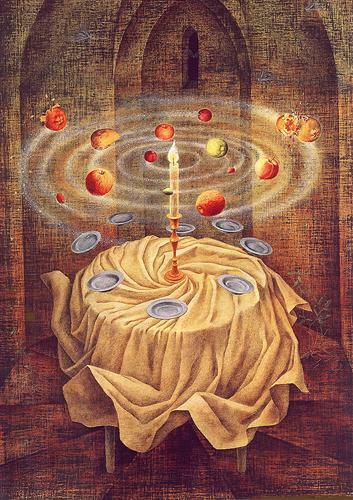 Remedios Varo was a Spanish-Mexican surrealist. I believe this is the last painting she completed before she passed away in 1963. I like the contrast between the lines that divide the background space versus the circles and sphere shapes we see from the table, plates and fruit in the center. The space is both fragmented and whole. The fruit and plates revolve around the candle like planets orbiting the sun. Though this is not a realistic scene, it is presented in a realistic and convincing way which is something I’d like to see in my own work someday. This is part of the Modern Nature exhibition at the De Young Museum and is one of O’Keeffe’s many Lake George paintings. The time she spent at Lake George and the work she did there is often seen as separate from her more famous desert landscapes and close up flower paintings. However, in this fantastic lecture by Erin Coe, chief curator of the Hyde Collection, Coe suggests that O’Keeffe’s time at Lake George isn’t a separate period, but rather a place that O’Keeffe returns to throughout her lifetime and whose influence can bee seen throughout her career. According to Coe, Lake George is where O’Keeffe created her first botanicals and it’s where she “found her balance between abstraction and nature.” It’s the place where the O’Keeffe we know today was formed. 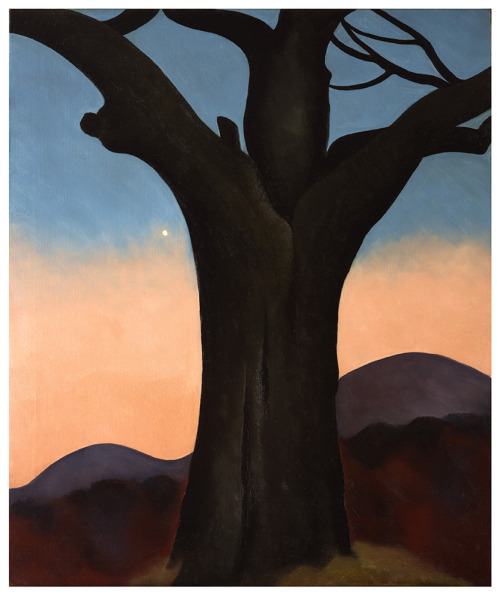 Coe notes that trees are one of the most underrated subjects in O’Keeffe’s body of work even though they are the most enduring of all her subjects. With over 31 canvases of trees O’Keeffe repeatedly returns to this subject over the course of seven decades. On a personal level, I’m drawn to O’Keeffe’s color selection and the contrast she achieves through her use of tertiary colors offset by grayer tones. 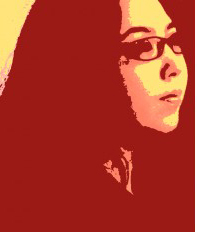 There’s a feeling of both unity through color harmony and fragmentation through her division of the surface. A little rushed today. It’s our 6 year wedding anniversary and so I’m trying to get enough work done on assignments to take some time off. Plus, I’m having internet connection problems again. O’Keeffe is a fascinating individual and there’s so much more about her I want to post, so I’ll have to write more about her in the coming weeks. I saw her work featured at de Young Museum online and decided to post this one today for sentimental reasons. The shape and character of the chestnut tree remind me of where Jeff and I said our vows. We said them in private before the wedding underneath a similar tree overlooking the Puget Sound. The close up view of the tree overlooking a vista of abstracted hills/mountains/peaks reminds me of home. 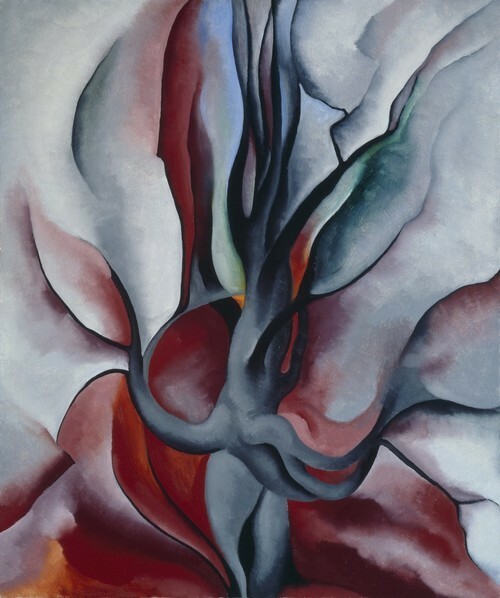 What I love about O’Keeffe is that although she is simplifying forms, her work is not simple. I mentioned last week that I love how she combines realist and abstract elements. This is a great example of what I mean. There is a hierarchy of abstraction and detail with the hills in the background being the most abstract and the tree in front, the focal point, containing the most detail.